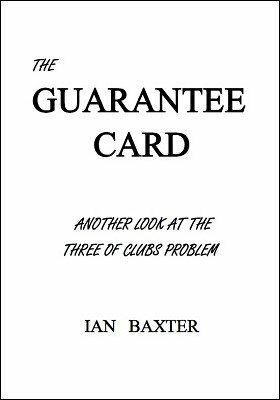 "Another look at the Three Of Clubs problem" and you will be hard pressed to find an easier, more practical application than this one. Performer places a card on the table, spectator thinks of and names any card in the deck. Performer turns over his prediction and wow...that's it! The raw effect is impressive: Performer extracts a card from the deck, placing it face down to the table. Spectator now names any card that comes to mind, with the tabled selection revealed as the one thought of. Yes, as brief and as straightforward as that. A firm favourite that has been making the rounds for decades, The Three Of Clubs is one of those fast, miraculous card stunts that can really impress. However, it can flop and if the presentation is botched, even remotely, the trick dies straight away. Although John Northern Hilliard's Greater Magic is perhaps the first and most popular reference for this, Ralph W. Hull actually slapped the effect into print some years prior to 1938, the year Greater Magic was released. Hull's book Eye Openers appeared in 1932, with the precursor to Hilliard's entry within its pages. Another early version that surfaced around the same time, came from Arthur Leroy and appeared in Encyclopedia Of Card Tricks . For me, interest really took off when, during the closing weeks of 1963, I made a bee line for my local Post Office, keenly filling out a money order payable to Hugard's Magic Monthly for a one-year subscription. In due time the first issue arrived, October for that year. Tearing the envelope open, I glanced at the front page ... 'The 3 of Clubs Revisited' by Ed Marlo. It’s not what the description says. You have to do a card switch in plain view of your spectator. It’s not even explained good. The description on how to do the “move” is terrible.